Congratulations to Ali Milligan & Allie Graves! 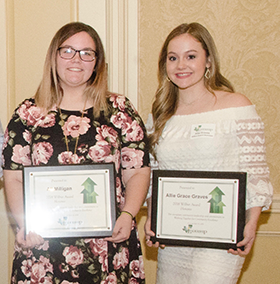 The 2018 Youth recipients of the 2018 Wilbur Award are Ali Milligan of Arkansas High (left) and Allie Graves of Texas High (right), two outstanding young women leaders in our community. Ali Milligan is a junior at Arkansas High where she is president of the campus Interact Club with over 400 of hours of community service. Ali worked with the Salvation Army to identify the greatest need of the people served by the organization, and has since worked to fill that need, providing kits of feminine products to their clients, with the ambitious goal of distributing 1000 kits before she graduates in 2019. Comments on "PROFILE: Ali Milligan & Allie Graves"